An ACL knee injury is a common problem in sport but did you know that only 20% of all ACL injuries are a result of direct contact? The majority of ACL injuries occur from awkward twisting movements of the knee, particularly when the foot is stuck to the ground. Injuries range from a minor sprain to a complete rupture and depending on the severity can take months to fully recover from. It may be a simple set of rehab exercises or full blown knee surgery. Here we will look at answers to the most common questions about an ACL knee injury including how it happens, ACL symptoms after injury, accurate diagnosis, associated injuries, treatment options and prevention strategies as well as looking more in-depth about why the role of the ACL is so important. But what is the ACL? ACL stands for anterior cruciate ligament and it is one of four ligament in the knee. 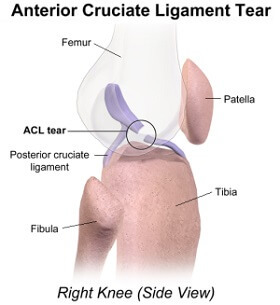 "Anterior" means situated at the front, "cruciate" means shaped like a cross and a "ligament" is a band of tissue connecting bones. The anterior cruciate ligament is one of four ligaments in the knee which sits deep inside the joint. It is extremely important as it controls the stability of the knee, preventing the lower leg from sliding too far forwards or twisting too much. The ACL is 2cm long, as thick as a pencil and extremely strong. To find out more, visit the ligament anatomy section. An ACL knee injury occurs when the anterior cruciate ligament is overstretched, usually by the knee bending backwards too far or twisting awkwardly. This can result in a partial tear to the ligament (a few of the fibres are torn), or in more serious cases a rupture (when it tears completely). The ligament can be stretched just under 2mm before it will tear. In some cases, nearby structures such as the cartilage and medial collateral ligament may also be damaged at the same time. 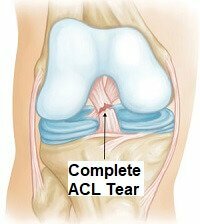 What Causes an ACL Knee Injury? 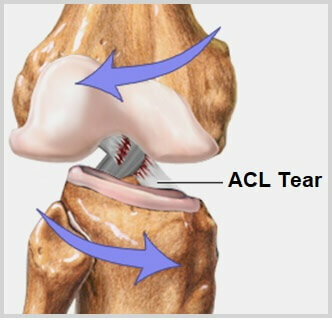 An ACL knee injury can also occur at other times for example car accidents, falling, or from wear and tear. Whilst ACL knee injuries most commonly occur in men, this is because they are more likely to play high risk sports. In actual fact, studies have shown that women are at greater risk being approximately 5 times more likely to suffer from an ACL knee injury. This is thought to be due to a combination of factors including hormone levels, ligament structure, pelvis angle, hamstring flexibility and size of the ligament itself. A doctor can usually accurately diagnose an ACL knee injury by carrying out a clinical examination. The most common tests used are the Pivot Shift, Anterior Drawer and Lachmans Tests. The video here from the American Academy of Orthopedic Surgeons shows a positive Lachmans test i.e. an ACL rupture. Diagnosis is often confirmed with an MRI which will also show if any other structures in the knee have been damaged as well. Sometimes with an ACL knee injury, the force going through the knee is so great that other nearby structures are damaged at the same time. The most common associated injury is a meniscus tear, the special cartilage which lines the knee joint. 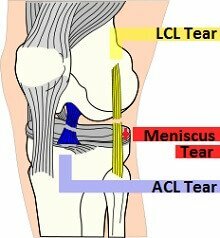 A tear of the lateral meniscus on the outer side of the knee is most common with an ACL knee injury. Sometimes the medial collateral ligament is also damaged. When all three structures are injured, it is known as the Unhappy Triad / O'Donoghue Triad. This most commonly happens when injury comes from a force through the outer side of the knee when the foot is fixed on the ground. Treatment of an ACL knee injury will depend on a combination of things: the degree of injury, the level of instability and the lifestyle of the individual. It can be managed either surgically or conservatively with an exercise programme. Exercise programmes for a partially or completely torn ACL look to build up the strength of the knee muscles so that they provide enough support and stability for the knee to compensate for the torn ACL. It also helps train the muscles and other ligaments to provide proprioceptive feedback to gain more stability. It usually takes a few months of rehab to fully recover conservatively from an ACL knee injury. Wearing a knee brace can help to provide support and stop the knee from giving way. For someone who does not intend to return to sport, or only to activities such as cycling and running, rehab is usually the preferred treatment. Surgery is indicated if the knee keeps giving way/buckling. Any time this happens, there is a risk of damage to the other structures in the knee, particularly the cartilage/meniscus. There are two surgical options, depending on the type of ACL knee injury. In some cases, the ligament can be repaired, but more commonly, it needs to be replaced with a new substitute ligament, known as an ACL reconstruction. If other structures have also been damaged, such as the meniscus, they are also sorted out at the same time. 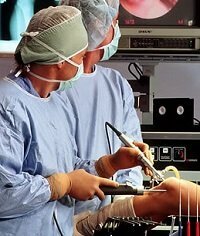 Visit the ACL Knee Surgery and ACL Reconstruction pages to find out more, including information on recovering from surgery, problems after surgery and rehab protocols. Something else that can really help, whether you need surgery or not, is a knee brace to provide extra stability for the knee. Many people find they are able to continue with sports after a partial or full tear of their anterior cruciate ligament if they find the right brace. Visit the ACL brace section to find the best brace for you. Why Is the ACL So Important? As well as protecting against abnormal knee movements, the anterior cruciate ligament is also the primary structure for providing proprioception in the knee. Proprioception is where the nerve fibres give the body a sense of the knees position and movement – a normal feature for all joints. For example, close your eyes and touch your finger to your nose. You can do it accurately even though you can’t see what you are doing – proprioception lets you know where the different parts of your body are and what they are doing. The anterior cruciate ligament is responsible for providing proprioceptive input at the knee, sending important information to the muscles that provide the reflex control of knee movement – meaning they constantly make small adjustments to the knee to keep it stable without us being consciously aware of it. Without the anterior cruciate ligament, the knee loses it proprioceptive input and therefore is unable to help the muscles make subtle adjustments to keep the knee stable e.g. when changing direction or when on uneven ground. With an ACL knee injury, this loss of proprioception can be compensated for, to a certain extent, by specific exercises for the knee muscles. However, for people who have a high demand for proprioception e.g. those who play sports, this may not be enough. Prevention is always better than cure and this is particularly the case with an ACL knee injury due to the long recovery time, cost and potential problems in the future. There are a number of things you can do to reduce the risk of injury including special exercise programmes and wearing a specially designed knee brace. You can find out more in the ACL knee injury prevention section.